There must be millions of living artists in the world. In fact I just looked it up and it turns out there are 4.4 million active artists in the USA alone, of which 3.2 million are recreational artists, 600,000 are professional artists and 122,000 are art-degree-seeking college students (http://www.artistmentorsonline.com/?tag=how-many-artists-are-there). The figures are mind-blowing, or maybe disconcerting, but that's not what this post is about. In this crowded field, how does one choose artists to look at or to focus on, those who can answer questions one might have or give one ideas? Mostly, for me anyway, it's luck or serendipity. Usually wherever I land up turns out to be instructive or inspiring in some way or other. In this way, while reading recently about Donald Baechler, he mentioned Brendan Cass (b. 1974, American) as a young artist to watch. So I followed that lead and it proved to be a good one to share. The image at left shows some of Brendan Cass's paintings, and below that some journal notes from a video interview at a show in Lars Bohman Gallery in ?Stockholm, Nov-Dec 2009. I'm not sure if this artist has hit the big time yet but he's certainly heading that way. The paintings are large to very large (e.g. 6' x 12') and are loosely based on photos. They seem very free and spontaneous but he takes a long time over them. He uses store-bought small canvases to try out colour combinations. Often he works from the photo first and goes to visit the place/country afterwards, and he has a particular liking for Northern countries and winter landscapes. 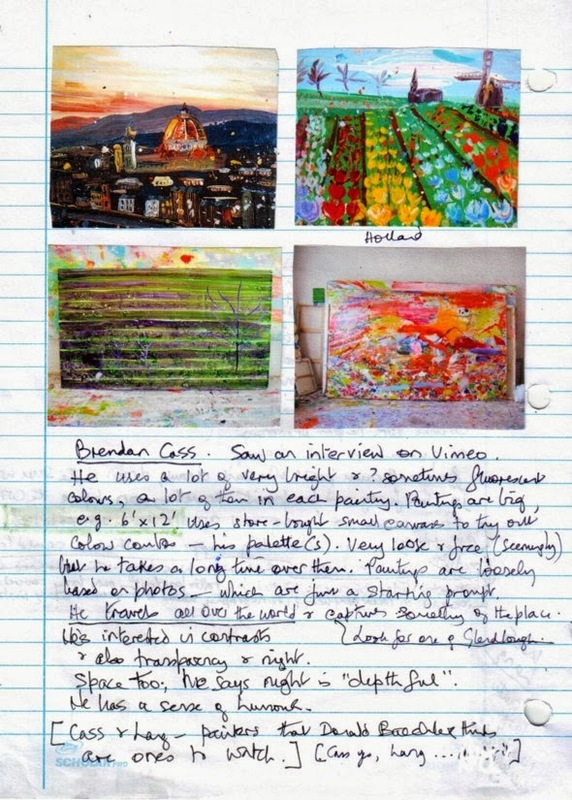 He uses bright, even fluorescent colours, saying he likes to load a painting with as many colours as possible. The paintings are very gestural and loaded with texture and yet they don't look messy. They remind me of Peter Doig in their evocation of mood and space. He has done at least one of Ireland (Glendalough) which I would love to see but haven't been able to find it. Q4. How come the idea of representing people and landscape in a monochrome and uniform motion way? For instance, the album cover for Blur, the animation for the Expo. My first experience of his work was during a visit to the Tate Modern in London in, I think, 2006. There was one of his life-size cars made of painted plywood (1996) which made me smile and lifted my spirits, I don't know why. Perhaps that's how he wants the viewer to feel. But thinking it is one thing, making it happen is another. The car forms are a marvel of simplifying and yet transforming the object into another kind of reality. I've found simplifying in general much harder to do than it looks. Julian Opie makes it look easy. His body of work is huge as seen in his website. He has also made public art for cities around the world on commission. Calgary is fortunate to have the one in the video below. The figures have been described as "cartoon figures" -- I can't see them that way. To me the movement is marvellous, the way the heads bob just a little and the way the gait of each walker is different despite being pared down to essentials. This is easiest to see where a couple are walking together, such as Kris and Verity Walking, 2010 (in the Barbara Krakow gallery, link above). It reminds me of something in Shakespeare ... "Great Juno comes, I know her by her gait" *... and how amazingly true that is. Note: The link to the second video has been playing tricks. If the wrong video appears please let me know and try reloading the page. 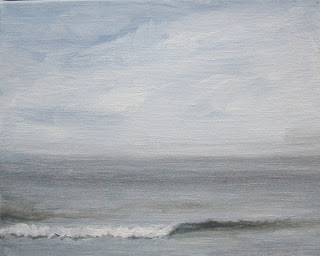 Saturday was the ASTT paint-out at Maracas Bay, part of the Worldwide Paint-out event. The weather was dubious and I was unsure whether to go but since everything was packed from the night before and it wasn't actually raining I decided to set out and to turn back if it got worse. I took acrylics and one of the 8 x 10" canvases. Luckily the rain held off. 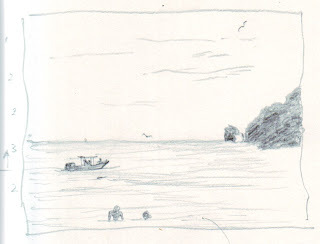 When I arrived no other painters were there ... looked around and then parked in front of the hotel and set up in a narrow strip of shade at the side of a red shark and bake hut. 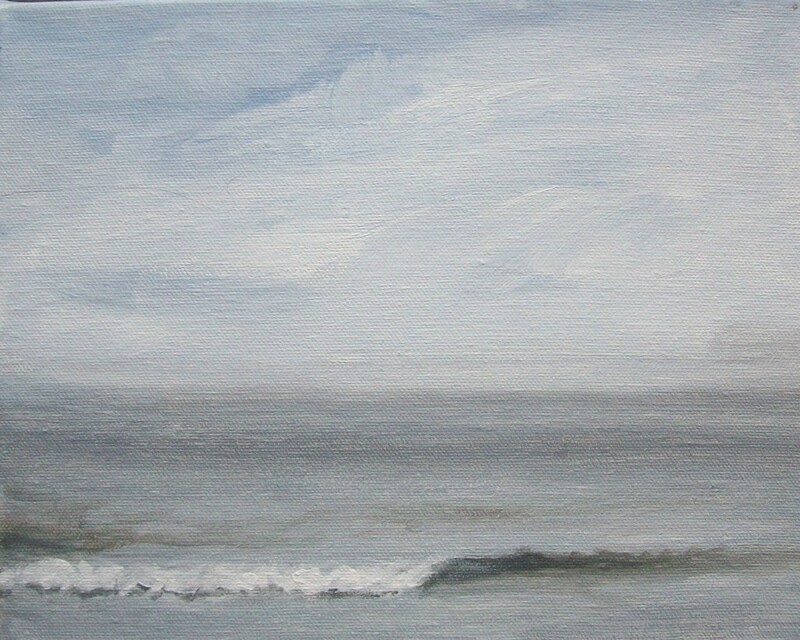 It was calm, overcast with little breeze and the sea was flat. There were some birds – pelicans. I'm not a beach person but there's something about Maracas that gets to me. Peter Sheppard and Beverly Fitzwilliam came along as I was finishing. Peter took a photo of my little piece. They said it was the first for the paint-out because yesterday at the Savannah was rained out. Uneventful drive home although there was some sinister-looking rubble on the road by the big cliff and further on a tree or large branch had fallen across the road and had already been chopped and cleared. I don't remember seeing it earlier. Based on the result of a survey in Newsletter #2, I will be changing the frequency of the newsletter to quarterly. Therefore the next issue will be in mid- to late November. If you didn't get the last issue and you're on Gmail, it may have gone into the "Promotions" tab. This happens even to me when I'm testing it, and to other emails that I subscribe to, so I have thrown out this Gmail feature. I don't know if there's a way around it. What happened wasn't enough to call it an "incident" but that's the word that comes to mind. I will try to relate it. 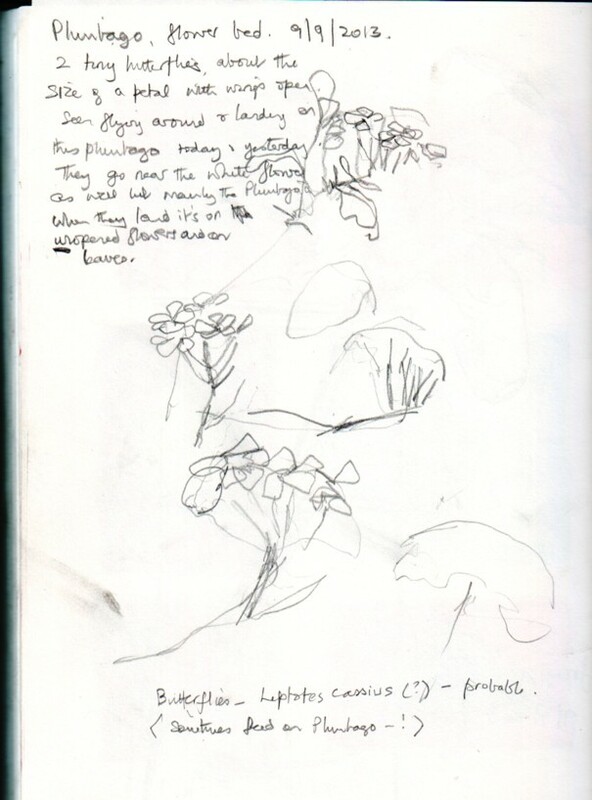 This morning I went outside to draw the plumbago. I do this often and have been doing so for years. I'm still getting to know it and trying to understand the way it grows which is extremely odd and unusual. As I was drawing, a little butterfly came along, a very tiny one. It fluttered around the plumbago, stopping on a leaf now and then. Then it fluttered off elsewhere. A few minutes later it was back. 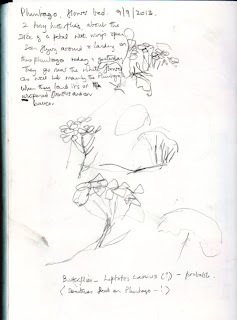 I had seen it yesterday too and noted that it seemed to choose the plumbago over the other plants in the area, and that in some ways it resembled the plumbago flower just a little -- it was about the size of a single petal and pale-coloured with a hint of blue. So I put down the pencil and decided to observe it a while. It would flutter away over a taller bush and disappear from sight and then return a few minutes later. When it landed on the plumbago it didn't land on an open flower, instead it chose a leaf or a head of unopened small green buds. I don't think it was feeding but can't say for sure. At any rate, it seemed as if it was landing intentionally on the plumbago, that it wasn't just chance. After ten or fifteen minutes of coming and going, to my surprise a second one of the same kind came along. I was pretty sure now that it was no accident. They moved very quickly so it wasn't possible to get a good look, fluttering around and around, up and down, settling for a second or two and then off again. 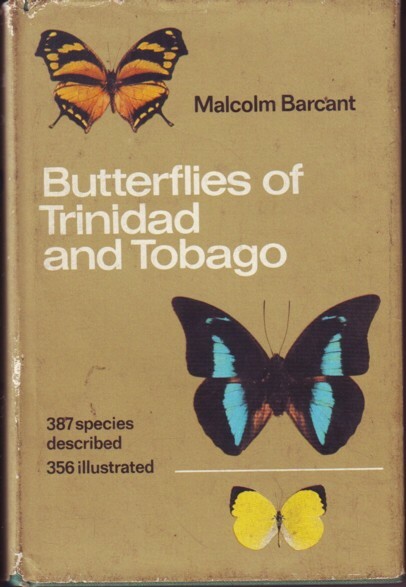 Rain was threatening so I packed up and went inside and looked out the Butterflies of Trinidad and Tobago by Malcolm Barcant (1970, Collins), with its wonderful colour plates. There wasn't much to go on except the small size, and when it closed its wings the undersides were pale beige with dark spots. Quite nondescript really, not easily identified like the Morpho. But Plate 9, No. 20 looked like it could be it -- Leptotes cassius? Also known as Meadow Blue, and belonging to the Lycaenid family. It's a common species says Barcant, "a common beauty ... lover of wide open spaces, abundant sunshine and low-growing ground shrubs with flowers." (p. 84). 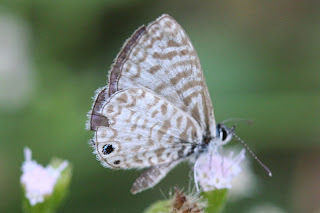 Leptotes cassius, commonly known as the Cassius Blue or Tropical Striped Blue, is a butterfly of the Lycaenidae family. It is found in Florida and the Keys, Texas south through the Caribbean, Mexico, and Central America to South America. Strays can be found in New Mexico, Kansas, Missouri and South Carolina. The wingspan is 20–35 mm. The butterfly species has an important role in Marisha Pessl's 2006 novel Special Topics in Calamity Physics. The protagonist, Blue van Meer, is named in honor of the Cassius Blue. The caterpillars feed natively on Fabaceae. Foodplants on record are Amorpha crenulata, Woolly Rattlepod (Crotalaria incana), Galactia regularis and Lima Bean (Phaseolus lunatus). It can also successfully develop feeding on Cape Leadwort (Plumbago auriculata) or Doctorbush (P. scandens), which (among the eudicots) are not closely related to its usual foodplants. (Underlining added). This last was a surprise as I've looked up Plumbago many times and have not previously seen it identified as a food plant for any butterfly. So that explained it ... the two butterflies were checking out the plumbago as a place to lay eggs where its caterpillars could feed. THE END. Sorry if it's a terrible anti-climax, the "incident of the butterfly" was a simple little occurrence that gave me pleasure and that I wanted to share. Contemporary abstract artist Martin Wohlwend of Liechtenstein working in his studio. That's oil stick he's using. He does sometimes use colour but not in this video, it's an all-black work. I found it fascinating to watch.